6061 is one of the most versatile and economical of the heat-treatable aluminum alloys. It has very good corrosion resistance and has excellent formability and weldability with relatively high strength. 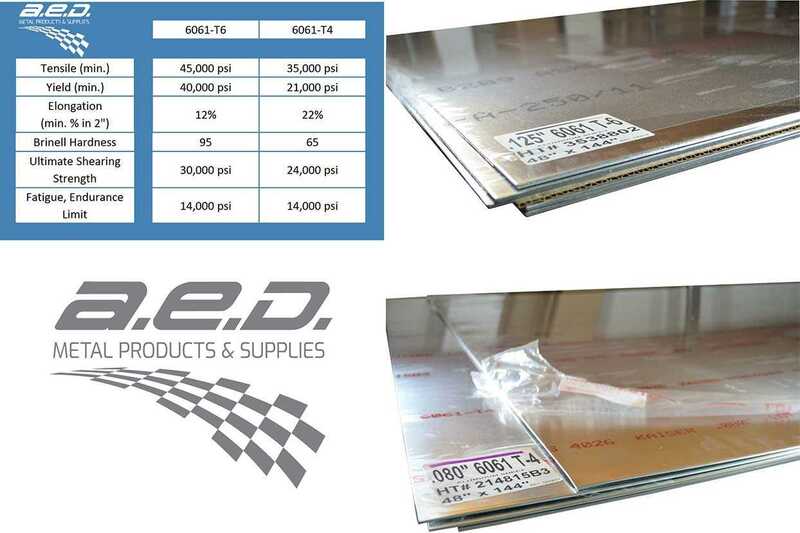 6061 is the strongest grade of aluminum sheet stocked by A.E.D and is available in both the T6 and T4 tempers. 6061-T6 is the more rigid of the tempers and is best used for parts that will not have any forming done to the material. To achieve the T6 temper, the material goes through a solution heat- treatment process(1) and then is artificially aged(2). 6061-T6 sheets meet the aerospace specification AMS 4027 and AMS QQ-A-250/11. 6061-T4 is softer and is typically used for parts where the strength of 6061-T6 is needed but the material must be formed. To achieve the T4 temper, the material goes through a solution heat-treatment process(1) and then is naturally aged(3) to a substantially stable condition. 6061-T4 sheets meet the aerospace specification AMS 4026 and AMS QQ-A-250/11. (1) Solution heat-treatment, sometimes referred to as soaking, is the heating of an alloy to a suitable temperature, holding it at that temperature long enough to cause one or more constituents to enter into a solid solution, and then cooling it rapidly enough to hold these constituents in solution. (2) Artificial aging, sometimes referred to as precipitation hardening, is the process of hardening the material at elevated temperatures between 200 and 400 degrees Fahrenheit. (3) Natural aging, is the process of allowing the material to harden to the desired mechanical properties at room temperature. with articles like this one from A.E.D. !